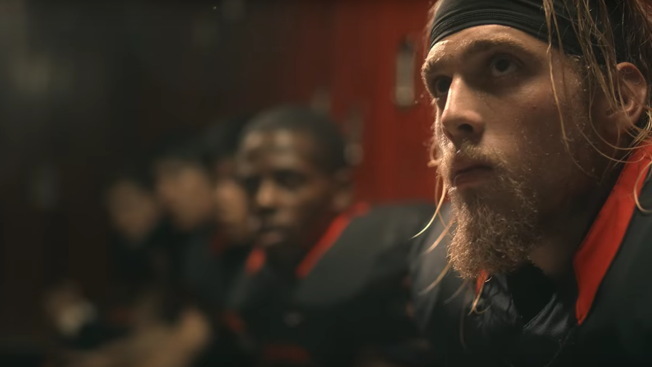 During this weekend's NFL playoffs on NBC, Microsoft debuted "Football, Teamwork and Technology," an ad featuring the Eagles, the California School for the Deaf's football team. "We're a brotherhood, we're a team," a player signs. Football is among the American sports that strikes an immediate emotional chord. In this case, it's also compelling to see how teamwork and communication—so critical to sports philosophy—play out among the Eagles. It's not something we get to see often. And here's what we see: less shouting and more tactility, with pensive shots of eyes that follow and interpret the split-second movements of hands, faces and bodies. Collaboration, we suddenly realize, is tangible—something you can see and touch. Amid all this are shots of plays, made mobile and more shareable by the magic of technology. "We use the Surface to communicate and prepare," the player signs, and at the end, a narrator drives the tablet's value add home: "For any player, for any coach, for any team, the art of collaboration builds champions." Get it? Because the Surface facilitates collaboration. We can roll with that, but something happens between that statement and the tagline that immediately follows—"Empowering us all: Microsoft." How do you go from being one useful tool in a collaborative arsenal to Empowerer in Chief? If you're a high school football fan who hasn't heard of the Eagles, that has more to do with the priorities of broadcast than its capacity to decimate. Microsoft made a smart choice in associating the Surface with a team that's both serious on-field and a blossoming subject of mainstream interest. In October, the Eagles were featured in ESPN's first-ever football broadcast to feature an all-deaf school, the Geico ESPN High School Football Showcase, where they destroyed Woodland Christian's Cardinals, winning 43-0. In fact, over the course of its last season, the Eagles lost only twice—to the Indiana School for the Deaf, and to Berean Christian—and otherwise outscored opponents by an average margin of 52-8. The team was also profiled in ESPN's E:60 Silent Night Lights (shown below), and in an "Underdogs" episode for Sports Illustrated some years before. When it comes to winning, technology is secondary to group cohesion. There's more to the Eagles' success than its choice of hardware—they've got discipline, brotherhood, high stakes, something to prove, and, yes, strong plays. So, it isn't the Surface (much less Microsoft) that empowers the Eagles. If they had to use binder paper, or sticks and rocks, to sketch plays, we're convinced they'd be just as strong on the field. Instead, it's the Eagles that empower the Surface, whose track record is somewhat less objectively impressive. There's nothing wrong with being one good tool in a winning arsenal; it's a respectable position in a context that, frankly, resembles teamwork. And what's kryptonite to a team? The one guy (or in this case, brand) that thinks he's responsible for all the magic.